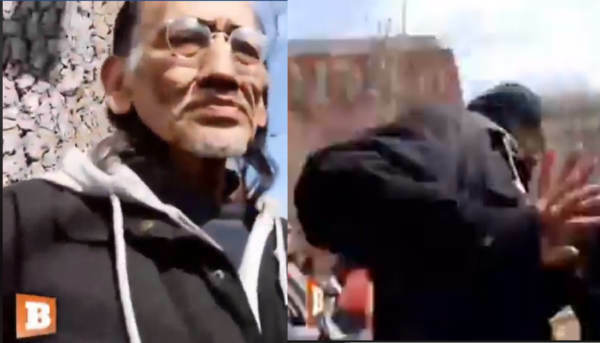 Far-left activist and valor thief Nathan Phillips hit a Breitbart reporter’s camera and ran when confronted about why he had approached the Covington Catholic students. Phillips was at a protest against the border wall outside the White House. Matthew Perdie was filming the protest for Breitbart when he attempted to speak to Phillips. The far-left activist smacked his camera and bolted — in a really cartoonish fashion. “He pushed me and immediately fled after I asked him the question,” Perdie told TGP. It appears that Phillips ironically doesn’t like people getting “up in his face.” Perhaps it would have been okay if Perdie was banging a drum while he approached him. The disgraced activist also spoke at the protest on Monday afternoon. Lin Wood, the attorney representing Nick Sandmann, announced earlier this month that he intends to sue Phillips for his “defamatory lies” about the students.